Last summer, we held our first Youth Skills Academy which was free to participants interested in learning from our staff and college alumni. The event received rave reviews from all who attended, so we are bringing it back again this summer! Like last year, we will have limited space so we would like all interested players complete this questionnaire to be considered for the Skills Academy. Then, on June 1st we will announce the players selected for the event. All participants will also receive a complimentary t-shirt. 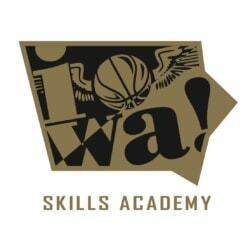 Over 400 athletes attended 4th-11th Grade tryouts last weekend in Cedar Rapids! After wrapping up their 2016-2017 season a few weeks ago in Las Vegas, the Iowa Barnstormers Basketball Club hosted their tryouts last weekend to start preparing for their 2017-2018 season. 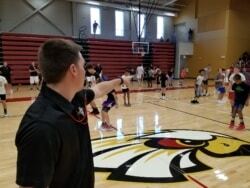 Over 400 young men in 4th-11th grades attended the tryouts, which were held at Coe College’s brand-new Athletic Performance Arena. The Barnstormers tryouts were one of the first events held in the new Arena. Athlete selections for the 2017-2018 are now underway for the Barnstormers. If you missed the first tryout and are still interested, the ‘Stormers will hold a second tryout session on August 27th. 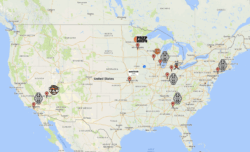 With their relationship with adidas, the Barnstormers are the only travel basketball team in Iowa that is sponsored by and plays on a national shoe circuit. Reprinted with permission from www.HawkeyeReport.com. When Joe Wieskamp arrived in Las Vegas for the Adidas Summer Championships, he knew that this would be the end of his seven year run with the Iowa Barnstormers AAU program. The journey of seven springs and summers with countless hours on the road, nights spent in hotels around the country, and hundreds of basketball games with his AAU team would be coming to a close. “I’ve been feeling this sense of the end coming. The entire seven years have been a great experience for me as a person and a player and I know this will be the end,” Wieskamp said. That end came after another run in bracket play, with a final four loss to the New England Playaz. Even getting that far was an achievement for a shorthanded Barnstormers. When they needed him the most, in the elite eight, Wieskamp was there with a sparkling 11-14 shooting performance, scoring 26 points in a victory over a very good D1 Minnesota squad. The fact that the Barnstormers were even in position of having a high sought after full shoe deal on the AAU circuit was seven years in the making with the Muscatine native leading the charge. That journey began seven years ago, when Wieskamp wasn’t a shooting guard raining in three pointers and making plays from the wing. What he was doing all those years ago was playing in the paint. What he has become is an elite high school shooting guard. What endless hours of hard work in the gym the past seven years has done is earn him four star status from Rivals.com and a #43 ranking in the Class of 2018. Wieskamp’s development and play was a big reason why the Barnstormers were given a shot at earning the Adidas shoe contract. The road began last year, when the Barnstormers crashed the Adidas party in the spring and summer. This year, they were a full member of the Adidas Gauntlet, with their 17’s finishing in the final four at the final two Adidas events and their 16’s squad, led by Patrick McCaffery, winning two events in July and finishing second in Las Vegas. Loyalty means everything to Wieskamp and over the years, he could have easily jumped to a bigger program with an existing shoe deal and never looked back. Instead, he stayed the course with the program that took him in seven years ago and the rewards came not only to Wieskamp, but to the entire Barnstormers program. The loyalty and example he set within the program will be his legacy with the Barnstormers. Wieskamp is as humble an athlete as you will meet, so don’t take his words as bragging. Just ask any of the Barnstormers coaches and they will tell you without hesitation that Wieskamp is the reason they have the Adidas contract and the opportunities it presented this year and into the future for the program. With his AAU career now over, Wieskamp will turn his focus to his senior year at Muscatine High School. He’s already earned Gatorade Player of the Year as a junior and is the odds on favorite to repeat that honor and is the leading candidate for Mr. Basketball honors in the state of Iowa. While those individual goals and honors are nice, Wieskamp’s goal is very simple. He’s already the Muskies all-time leading scorer with 1,573 points heading into his final year of high school. Wieskamp will need to score 621 points as a senior to pass former Hawkeye Jeff Horner as the all-time leading scorer in Class 4A in the state of Iowa and it’s a good bet that he gets there. His senior year is clearly in focus, but so is his long term future. In November, Wieskamp will sign to play basketball for the University of Iowa, where he has been committed since he was a sophomore.